" Hermione! Oh thank Merlin you&apos;re alright!" Harry said when he wrapped his arms around his sister and lifted her up with relief in his heart. He then hugged Ginny tightly too. " I thought you were lost forever" Ginny bumped her fist into Harry&apos;s shoulder. " You can&apos;t get away with us that easy"
They sat at the St. Mungos and had found the other missing girls. They had just been in time to save everyone from the poison with the help of Narcissa and Molly and some other healers at the hospital. Hermione went to see Parvati just to check if she was alright before she left. Draco and Hermione was finally home, and laid on the couch and just watched a muggle movie. It just had been way too long since they&apos;ve done something relaxing together. 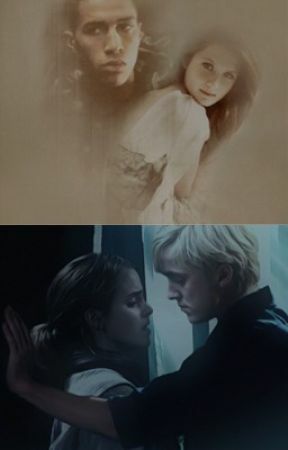 They decided to watch " The Notebook " and Hermione almost fell asleep in Draco&apos;s arms.
" Hermione, there is something I need to show you, and talk to you about" Draco said with a quiet voice and tried to wake her up. " Mhm...? About what?" She mumbled under her breath and " You have to wake up first, or else I won&apos;t tell" Draco said and shook her carefully.
" Okay, relax I&apos;m up....sort of" She sat up beside him and rested her head at his shoulder. " Good, because I have a surprise for you" " It better be a good one, I need to sleep" Hermione muttered. " Oh believe me, sweetie, you will love this surprise" He stood up and walked over the door. " I&apos;m just gonna go and get it for you. " " You&apos;re not leaving me again are you?" She said with a hint of worry in her voice. " I made a promise, Hermione. Remember? I will never leave you again" He opened the door slowly and didn&apos;t let his eyes off of her. " Just give me one minute okay? Barely even that" She nodded. " Okay"
Hermione walked out in the kitchen and realized how hungry she was. Thinking of Draco giving her a surprise, she decided to make a cake with strawberrys and cream on it. It would just be perfect. When she was about to start, she heard someone open the door and step in. " Hey Draco, I just got a crazy idea. I&apos;ll make a cake for us, just you and me. Doesn&apos;t that sounds great?" " Um...yeah awesome honey. But we&apos;ll have a problem if you&apos;re only cooking for two persons..."
Hermione turned around. " Why? Is Ginny and Blaise comming over?" She asked from the kitchen. " No, no not Ginny and Blaise"
Hermione was confused now. " Harry and Astoria? Pansy and Ron?" She guessed. " Nope" Draco said, and she could hear that he sounded very pleased with himself. " Then who is it?" She dropped everything and walked out. When she got out in the hallway her heart skipped only Merlin knows how many beats, and she almost stopped breathing. No, it couldn&apos;t be. This was all in her head. " Draco who...? What is going on here?" " Ain&apos;t you happy, Mione?" Draco said worriedly. " Don&apos;t you remember them?" Hermione was about to cry anytime soon.
" Of course I remember my own parents!"